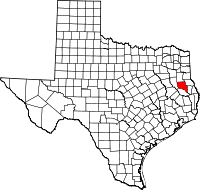 Nacogdoches County (/ˌnækəˈdoʊtʃɪs/ NAK-ə-DOH-chiss) is a county located in the U.S. state of Texas. As of the 2010 census, its population was 64,524. Its county seat is Nacogdoches. The Nacogdoches, TX Micropolitan Statistical Area includes all of Nacogdoches County. Nacogdoches hosts the Blueberry Festival the second Saturday in June. The county is the top blueberry producer in Texas and is headquarters for the Texas Blueberry Marketing Association. It recently tagged itself as the "Capital of the Texas Forest Country". The county is one of the first Texas Certified Retirement Communities. The county was created in 1826 as a municipality of Mexico and organized as a county in 1837. According to the U.S. Census Bureau, the county has a total area of 981 square miles (2,540 km2), of which 947 square miles (2,450 km2) is land and 35 square miles (91 km2) (3.5%) is water. As of the census of 2000, there were 59,203 people, 22,006 households, and 14,039 families residing in the county. The population density was 62 people per square mile (24/km²). There were 25,051 housing units at an average density of 26 per square mile (10/km²). The racial makeup of the county was 75.00% White, 16.74% Black or African American, 0.39% Native American, 0.70% Asian, 0.07% Pacific Islander, 5.70% from other races, and 1.41% from two or more races. 11.25% of the population were Hispanic or Latino of any race. There were 22,006 households out of which 30.50% had children under the age of 18 living with them, 48.30% were married couples living together, 11.80% had a female householder with no husband present, and 36.20% were non-families. 27.60% of all households were made up of individuals and 9.30% had someone living alone who was 65 years of age or older. The average household size was 2.49 and the average family size was 3.08. In the county, the population was spread out with 24.00% under the age of 18, 20.00% from 18 to 24, 24.70% from 25 to 44, 19.20% from 45 to 64, and 12.10% who were 65 years of age or older. The median age was 30 years. For every 100 females there were 93.00 males. For every 100 females age 18 and over, there were 89.00 males. The median income for a household in the county was $28,301, and the median income for a family was $38,347. Males had a median income of $29,502 versus $21,422 for females. The per capita income for the county was $15,437. About 15.50% of families and 23.30% of the population were below the poverty line, including 27.10% of those under age 18 and 13.90% of those age 65 or over. Greyhound Lines operates the Nacogdoches Station at the Kerrville Bus Company station in Nacogdoches. The Nacogdoches merchant and civic leader Carl Edwin Monk, Sr., was known as "Mr. Highways". The scenic area off State Highway 7 east of Nacogdoches bears his name. ^ "Nacogdoches County". Texas Almanac. Texas State Historical Association. Retrieved June 23, 2015. ^ " "Archived copy". Archived from the original on 2012-08-15. Retrieved 2012-07-30. CS1 maint: Archived copy as title (link)." Greyhound Lines. Retrieved on July 29, 2012. NOTE: The information for Nacogdoches appears as a pop-up window. Wikimedia Commons has media related to Nacogdoches County, Texas.